Error: Mooring is the Darsena wet dock is possible only for vessels with a draft under 2.1 meters. Embarking and disembarking passengers in Marina of Capri can only be done by purchasing a voucher directly from the Marina di Capri central office. Crafts without a voucher are prohibited from docking and embarking or disembarking passengers for goods inside the marina. Vouchers must be completed by the shipping company and most include the name of the shipping company, the first and last names of the ship captain or skipper, the date in which embarking and/or disembarking will take place, the number of passengers, and signatures of the captain or skipper and the marina staff in charge of vouchers. The voucher has an original and a copy, and the captain or skipper must show the copy to the marina staff when docking. If there is no voucher, crafts will not be allowed to dock. The voucher is only good for the date indicated regardless of whether the craft has docked once or twice. If the craft has only docked once, a second voucher is required to dock a second time on a subsequent date. Docking is permitted only for the time necessary to embark or disembark passengers. Vouchers are not good for mooring in the marina for longer periods of time. 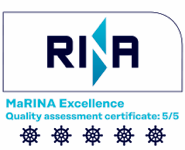 The Marina of Capri will provide an RFID reader (a deposit of €100 is required per reader) with an activated numerical code to each craft embarking and disembarking inside the marina. This reader will allow staff to identify the craft and add it to the data system that calculates regarding marina traffic and wait times for docking at any given moment, in addition to monitoring the number of times a craft docks and the order in which crafts should enter the marina. Shipping companies that intend to dock at the Marina of Capri are responsible for picking up their RFID reader and follow the procedures for its use. Please note that to verify the disembarkation tax required by the Comune di Capri, the Marina of Capri will electronically record the number of passengers who disembark and that this record will be available to the Comune di Capri for verification purposes. The maximum size limits for each category refer to both the maximum length and the maximum beam (including protrusions such as bowsprit, davits, beaches, delfiniera, etc.). Vessels that have a wider beam than that allowed in their maximum length category automatically pass to a higher category, until both the beam and the length of the vessel are within the maximum limit of that specific category. Rates and periods may change without advance notice. For vessels which measure more that 30 meters, the aid of a diver to anchor is free of charge and is to be requested at least 12 hours in advance at the office in order to allow the organization of the service. To avoid unpleasant misunderstandings at the time of payment, we ask that you verify your rate category carefully. Please note that Marina di Capri staff are not allowed to offer discretional discounts. For vessels up to a length of 18 mt, a minimum reservation of 2 days is required for weekends from April through September (friday/saturday or saturday/sunday). From October 15th to April 30th the boats with a maximum length of 9 meters, owned by the residents of the island of Capri, will be able to stop at the marina with the application of an all-inclusive flat rate of 60.00 euros per month over VAT. The holders of the annual contract may proceed with the replacement of the unit indicated in the contract with another of properties having the same characteristics or lower only during the period from October 1st and April 30th. € 200.00/hour (incl. VAT): inspection, maintenance, and cleaning of hull, propellers, valves, etc (price per hour of work). € 200.00/h (incl. VAT): search and recovery of anchors by lifting bag. € 150.00 (incl. VAT): search and recovery of objects lost overboard. € 500.00 (incl. VAT for 3 hours, extra hours € 200/h): underwater images of hull, propellers, etc. taken with a digital camera and saved on CD or DVD. Please note: These services are available inside the Marina while the vessel is moored. For services outside the Marina, conditions and prices must be agreed upon on a case-to-case basis.